Banking Software is rapidly increasing its relevance in today's global society. Over the last decade, technology has changed the world we live in. Businesses have used technology to become more efficient, cost-effective and grow. Indian banking industry is ongoing a transformation driven by changes in Access Control and its adoption. The eCommerce development in the hand of BlueHorse Software has upgraded the online banking to its highest pick. Now, if your bank or credit society needs any eCommerce application to resolve online banking then we are the fittest for your purpose. A System for Employee's CreditSociety/Patsanstha (Marathi/English). FinCORE has been designed keeping in mind the extensive requirements of the financial services industry, FinCORE is built to deliver in time and with the prevalent best-practices in the industry. IIS Published .Net Solution Ajax Enabled with MS SQL Server as Back End Database. Simple Scalable Roboust Secure Solution. BankSoft – Core Banking Solution is a comprehensive solution aimed at meeting the requirements of the financial institutions. Built on latest technology platform, the solution offers unparalleled scalability and security to banks. We have developed the software for Co-Operative Bank. Our development is in the area of on-line Banking operation, Tele-Banking and Core Banking Systems. 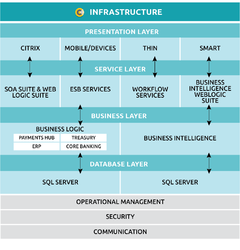 Software products of our Company range from total branch automation (TBA) to the core banking solution (CBS). Robust Internet banking, core banking, retail banking, and Islamic banking capabilities for simplified operations and enhanced customer satisfaction. In today's banking environment, where customer value is at core of operations, creating and nurturing long-term relationships with customer is key to maximize bank's wallet share. A multi-tiered, modularly integrated, SOA-based core banking solution ... with best of breed functional modules and a full complement of state-of-art features. Our core banking implementation team consists of experiences resources, who were involved in the CBS rollout projects of various Nationalized and Regional Rural Bank across India. Team is confident in legacy data Mapping, data extraction, Conversion in flat file format and data uploading in CBS server. Sufficient resources are available for pre & post migration support of the branches.